What’s New in Docker Enterprise Edition 18.03 Engine Release? A New Docker Enterprise Engine 18.03.0-ee-1 has been released. This is a stand-alone engine release intended for EE Basic customers. Docker EE Basic includes the Docker EE Engine and does not include UCP or DTR. 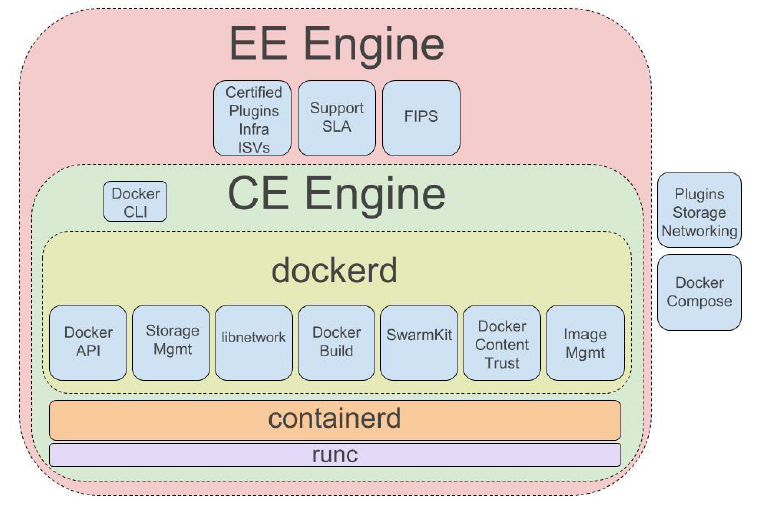 In my recent blog, I talked about “Docker EE 2.0 – Under the Hood” where I covered on 3 major components of EE 2.0 which together enable a full software supply chain, from image creation, to secure image storage, to secure image deployment. Under this blog post, I am going to talk about what’s new features have been included under the newly introduced Docker EE 18.03 Engine. Let us talk about each of these features in detail. containerd is an industry-standard core container runtime. It is based on the Docker Engine’s core container runtime to benefit from its maturity and existing contributors. It provides a daemon for managing running containers. It is available today as a daemon for Linux and Windows, which can manage the complete container lifecycle of its host system: image transfer and storage, container execution and supervision, low-level storage and network attachments. Kubernetes Container Runtime Interface. CRI is a new plugin which allows connecting the containerd daemon directly to a Kubernetes kubelet to be used as the container runtime. The CRI GRPC interface listens on the same socket as the containerd GRPC interface and runs in the same process. containerd 1.1 announced in April implements Kubernetes Container Runtime Interface (CRI), so it can be used directly by Kubernetes, as well as Docker Engine. It implements namespaces so that clients from different container systems (e.g. Docker Engine and DC/OS) can leverage a single containerd instance on one system while being logically separated. This release allows you to plug in any OCI-compliant runtime, such as Kata containers, gVisor etc. And includes many performance improvements such as significantly better pod start latency and cpu/memory usage of the CRI plugin. And for additional performance benefits it replaces graphdrivers with more efficient snapshotters, that BuildKit leverages for faster build. FIPS stands for Federal Information Processing Standard (FIPS) Publication. It is a U.S. government computer security standard which is used to approve cryptographic modules. It is important to note that the Docker EE cryptography libraries are at the “In-process(Co-ordination)” phase of the FIPS 140-2 Level 1 Cryptographic Module Validation Program.The Docker platform is validated against widely-accepted standards and best practices is a critical aspect of the product development as this enables companies and agencies across all industries to adopt Docker containers. FIPS is a notable standard which validates and approves the use of various security encryption modules within a software system. compatibility is one of notable feature introduced with this newer release. Refer https://docs.docker.com/ee/engine/release-notes/#runtime for more information. With Docker EE 18.03 EE Release, there is a support for –chown with COPY and ADD in Dockerfile. This release improve security by enabling developer-specific users vs root for run-time file operations. This release provide parity with functionality added in Docker CE. At this point of time, this has been introduced under Linux OS only. Under Docker EE 18.03 release, now you can use the same Compose files to deploy apps to Kubernetes on Enterprise Edition. This feature is not available under any of Desktop or Community Edition Release. You should be able to pass –orchestrator parameter to specify the orchestrator. This means that it should be easy to move applications between Kubernetes and Swarm, and simplify application configuration. Under this release, one can create native Kubernetes Stack object and able to interact with Stacks via the Kubernetes API. This release improve UX and move out of experimental phase. Functionality now available in the main, supported Docker CLI. Docker Content Trust was introduced first of all in Docker Engine 1.8 and Docker CS Engine 1.9.0 and is available in Docker EE.It allows image operations with a remote Docker registry to enforce client-side signing and verification of image tags. It enables digital signatures for data sent to, and received from, remote Docker registries. These signatures allow Docker client-side interfaces to verify the integrity and publisher of specific image tags. Docker is a full development platform for creating containerized apps, and Docker for Mac is the most efficient way to start and run Docker on your MacBook. It runs on a LinuxKit VM and NOT on VirtualBox or VMware Fusion. It embeds a hypervisor (based on xhyve), a Linux distribution which runs on LinuxKit and filesystem & network sharing that is much more Mac native. It is a Mac native application, that you install in /Applications. At installation time, it creates symlinks in /usr/local/bin for docker & docker-compose and others, to the commands in the application bundle, in /Applications/Docker.app/Contents/Resources/bin. One of the most amazing feature about Docker for Mac is “drag & Drop” the Mac application to /Applications to run Docker CLI and it just works flawlessly. The way the filesystem sharing maps OSX volumes seamlessly into Linux containers and remapping macOS UIDs into Linux is one of the most anticipated feature. Docker for Mac runs in a LinuxKit VM. Docker for Mac uses HyperKit instead of Virtual Box. Hyperkit is a lightweight macOS virtualization solution built on top of Hypervisor.framework in macOS 10.10 Yosemite and higher. Docker for Mac does not use docker-machine to provision its VM. The Docker Engine API is exposed on a socket available to the Mac host at /var/run/docker.sock. This is the default location Docker and Docker Compose clients use to connect to the Docker daemon, so you to use docker and docker-compose CLI commands on your Mac. When you install Docker for Mac, machines created with Docker Machine are not affected. There is no docker0 bridge on macOS. Because of the way networking is implemented in Docker for Mac, you cannot see a docker0 interface on the host. This interface is actually within the virtual machine. Docker for Mac has now Multi-Architectural support. It provides binfmt_misc multi architecture support, so you can run containers for different Linux architectures, such as arm, mips, ppc64le, and even s390x. Under this blog, I will deep dive into Docker for Mac architecture and show how to access service containers running on top of LinuxKit VM. At the base of architecture, we have hypervisor called Hyperkit which is derived from xhyve. The xhyve hypervisor is a port of bhyve to OS X. It is built on top of Hypervisor.framework in OS X 10.10 Yosemite and higher, runs entirely in userspace, and has no other dependencies. HyperKit is basically a toolkit for embedding hypervisor capabilities in your application. It includes a complete hypervisor optimized for lightweight virtual machines and container deployment. It is designed to be interfaced with higher-level components such as the VPNKit and DataKit. Just sitting next to HyperKit is Filesystem sharing solution. The osxfs is a new shared file system solution, exclusive to Docker for Mac. osxfs provides a close-to-native user experience for bind mounting macOS file system trees into Docker containers. To this end, osxfs features a number of unique capabilities as well as differences from a classical Linux file system.On macOS Sierra and lower, the default file system is HFS+. On macOS High Sierra, the default file system is APFS.With the recent release, NFS Volume sharing has been enabled both for Swarm & Kubernetes. There is one more important component sitting next to Hyperkit, rightly called as VPNKit. VPNKit is a part of HyperKit attempts to work nicely with VPN software by intercepting the VM traffic at the Ethernet level, parsing and understanding protocols like NTP, DNS, UDP, TCP and doing the “right thing” with respect to the host’s VPN configuration. VPNKit operates by reconstructing Ethernet traffic from the VM and translating it into the relevant socket API calls on OSX. This allows the host application to generate traffic without requiring low-level Ethernet bridging support. 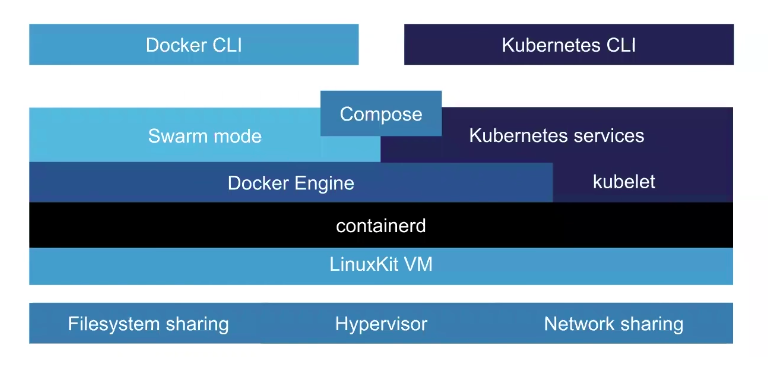 On top of these open source components, we have LinuxKit VM which runs containerd and service containers which includes Docker Engine to run service containers. LinuxKit VM is built based on YAML file. The docker-for-mac.yml contains an example use of the open source components of Docker for Mac. The example has support for controlling dockerd from the host via vsudd and port forwarding with VPNKit. It requires HyperKit, VPNKit and a Docker client on the host to run. Sitting next to Docker CE service containers, we have kubelet binaries running inside LinuxKit VM. If you are new to K8s, kubelet is an agent that runs on each node in the cluster. It makes sure that containers are running in a pod. It basically takes a set of PodSpecs that are provided through various mechanisms and ensures that the containers described in those PodSpecs are running and healthy. The kubelet doesn’t manage containers which were not created by Kubernetes.On top of Kubelet, we have kubernetes services running. We can either run Swarm Cluster or Kubernetes Cluster. We can use the same Compose YAML file to bring up both the clusters side by side. 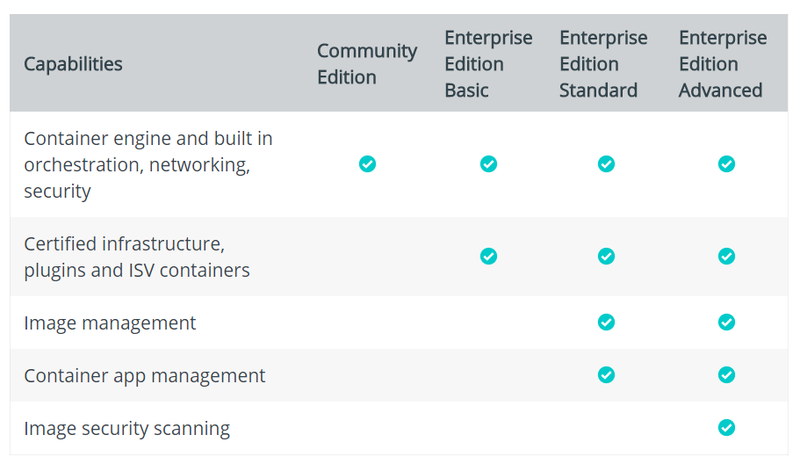 Curious about VM and how Docker for Mac CE Edition actually look like? Below are the list of commands which you can leverage to get into LinuxKit VM and see kubernetes services up and running. Here you go..
How to enter into LinuxKit VM? How to display containerd version? How shall I enter into docker-ce service container using containerd? How to verify Kubernetes Single Node Cluster? Docker 1.11 is two week old now. 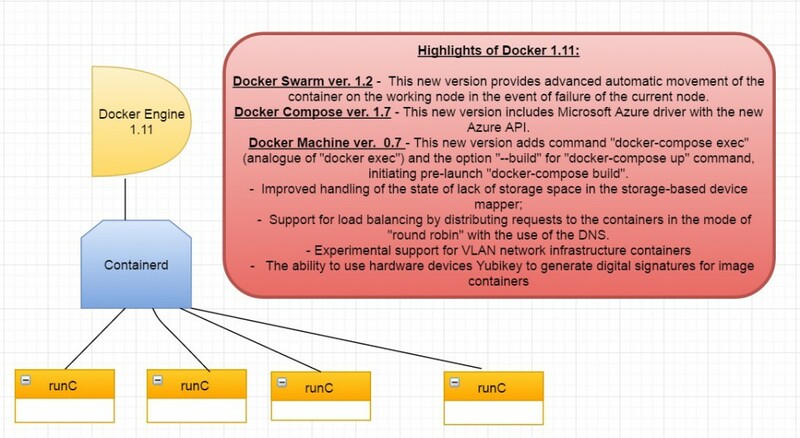 Popular for its Software Infrastructure Plumbing(SIP), Docker Inc. first focused on adoption of libnetwork, followed by Notary and Unikernel Projects and now rightly integrated Docker Engine with runC and containerd. What it really means is the management of containers is now split up into a separate piece of infrastructure plumbing called containerd, a daemon for managing runC. With this new release, Docker Engine is now more loosely coupled to the containers. As shown above, a Linux docker installation is now made of 4 binaries (docker, docker-containerd, docker-containerd-shim and docker-runc). Here is a brief explanation in case you are completely new to runC. runC is a lightweight universal runtime container. runC is built on libcontainer, the same container technology powering millions of Docker Engine installations.It is a CLI tool for spawning and running containers according to the OCP specification.The Open Container Project is an open governance structure for the express purpose of creating open industry standards around container formats and runtime. Projects associated to the Open Container Project can be found at https://github.com/opencontainers. runc integrates well with existing process supervisors to provide a production container runtime environment for applications. It can be used with your existing process monitoring tools and the container will be spawned as a direct child of the process supervisor. Containers are configured using bundles. A bundle for a container is a directory that includes a specification file named “config.json” and a root filesystem. The root filesystem contains the contents of the container. Docker Inc. built up containerd as a seperate daemon to move the container supervision out of the core Docker Engine.It is firmly believed that Containerd improves on parallel container start times which means if you need to launch multiple containers as fast as possible you should see improvements with this release.Containerd is claimed to have full Support For starting OCI bundles And managing Their Lifecycle. Containerd has full support for starting OCI bundles and mananaging their lifecycle. This allows users to replace the runC binary on their system with an alternate runtime and get the benefits of still using Docker’s API. When starting a container most of the time is spent within syscalls and system level operations. It does not make sense to launch all 100 containers concurrently since the majority of the startup time is mostly spent waiting on hardware / kernel to complete the operations. Containerd uses events to schedule container start requests and various other operations lock free. It has a configurable limit to how many containers it will start concurrently, by default we have it set at 10 workers. This allows you to make as many API requests as you want and containerd will start containers as fast as it can without totally overwhelming the system. Let’s look at how the newly added docker-runc and docker-containerd looks like in this new release. Hence, we saw how to get started with docker-runc. In the next post, we will look more into containerd daemon in more detail.